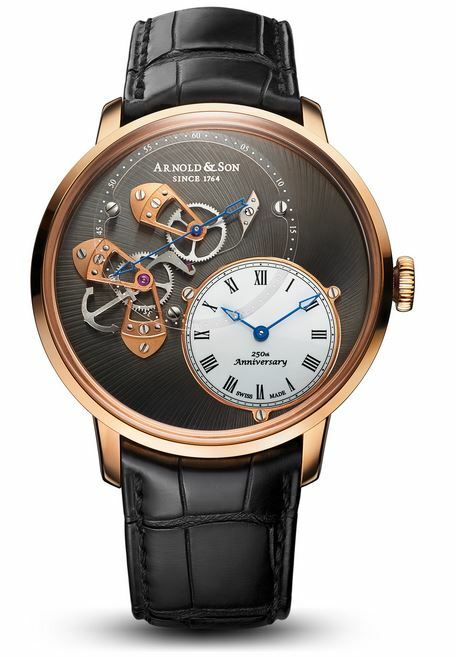 The second watch in their 250th anniversary collection, Arnold & Son has created the DSTB as part of the Instrument Collection. This special edition in 18 karat rose gold is limited to 50 pieces. In case you are wondering, DSTB stands for Dial Side True Beat. The DSTB pays tribute to the marine chronometers Arnold created with the help of his son during the second phase of his career, while the first watch of the anniversary collection TEC1 pays tribute to its legacy as a leader in creating complex and innovative timepieces. Main feature noticeable right away as the DSTB name suggests is the mechanism of true beat seconds. The seconds hand jumps only once, while the balance wheel continues to beat multiple times per seconds. 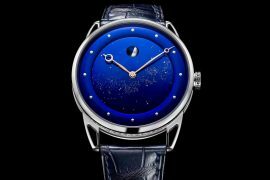 A much more common feature in quartz watches, this is the first time in mechanical watchmaking history that anyone is able to showcase the seconds mechanism in action on the dial side. The seconds’ mechanism in action is featured prominently at 11 o’clock with a large sub dial. The craftsmanship of it is of highest quality with attention to detail paid to every component. 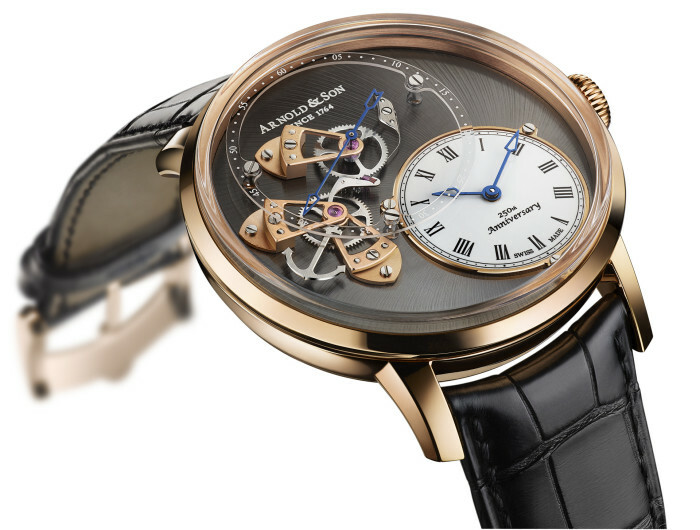 It features three bridges coated in rose gold, wheels, the lever and a blued hand. 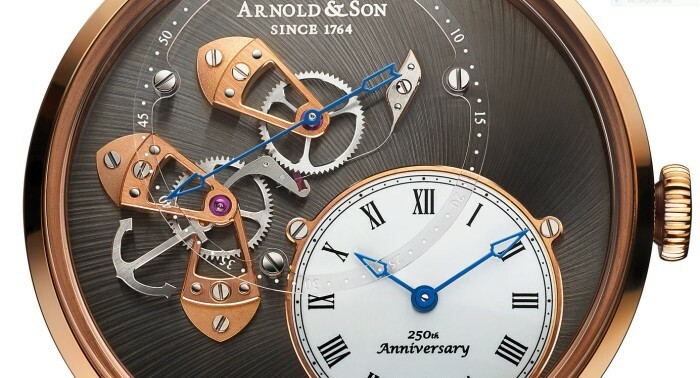 Paying tribute to Arnold’s achievements in maritime, it also boasts an anchor-shaped seconds lever. The hours and minutes are indicated by a white lacquered domed sub dial at 4 o’clock with blued hands and large black roman numerals. 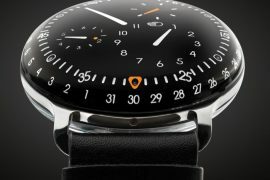 Two intersecting sub dials gives a three-dimensional look to the main dial. The new in-house built A&S 6003 self-winding mechanical movement powers the watch, and its workings are visible through the sapphire case-back. 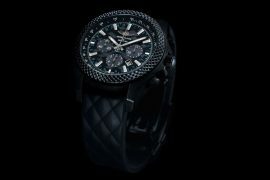 It boasts a 50 hour power reserve, a 28,800 vph frequency and a water resistance up to 30 meters. Movement features an array of beautiful decorations – such as hand-chamfered bridges and polished edges, fine circular graining, Côtes de Genève rayonnantes, and blued screws with mirror polished heads. 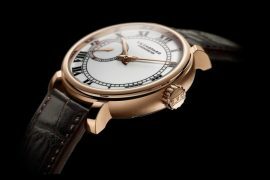 The 18 karat rose gold case measures 43.5 mm and available with a hand-stitched black or brown alligator leather strap. 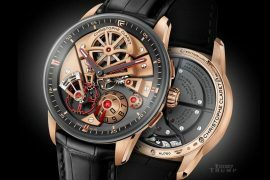 Price for the Dial Side True Beat is set at $47,350.